Home / News / Philippines / Judge Leni Robredo? Yaaas! This actually happened. But it was in the year 2012. Way far before the events in 2016 unfolded. Why rehash this news now? Well, with all what Leni Robredo is saying in the past weeks, which, by the way, don't make sense at all, imagaine how disastrous it would be for all of us if we had Leni as a trial judge. MANILA, Philippines – She is not interested in politics but Maria Leonor “Leni” Robredo might end up as a Regional Trial Court judge. The Judicial and Bar Council (JBC) shortlisted the widow of the late Interior and Local Government Secretary Jesse Robredo for 3 separate vacant positions for Regional Trial Court judge: Calabanga and Pili in Camarines Sur and Ligao City, Albay. The JBC interviewed Robredo on February 22. The shortlist will be sent to President Benigno Aquino III, who will make the appointment. Robredo is connected with the Naga chapter of Saligan, a national alternative lawyers’ group helping farmers. A seemingly clue-less political wife, Robredo entered national consciousness following the death of her husband on August 18. Aquino praised the widow and her three daughters for the strength they showed throughout the ordeal. 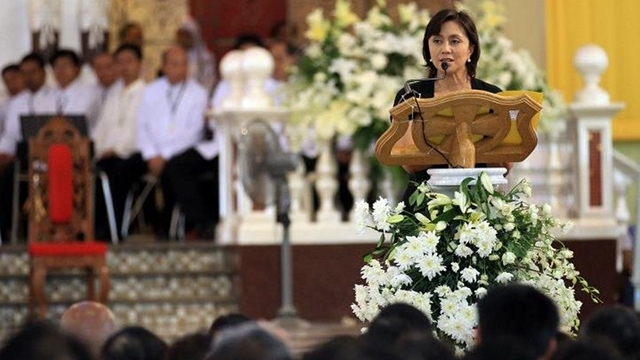 There have been calls for Robredo to enter politics and even run in the 2013 senatorial elections after the outpouring of grief for her husband. Budget Secretary Florencio "Butch" Abad, a close friend of the late Robredo, however said Mrs Robredo does not intend to join politics.